Carlo Maserati founds his own company In 1909. Our auto repair experts have built our reputation by providing consistently superior service here in Denver and Greenwood Village. I’m Saul Reisman, here at Saul’s Autotek, and today we’re going to talk to you about Maserati service. So, at Saul’s Automotive we’ve been servicing Maserati vehicles for the past 10 years, and we’re very familiar with the old models and the new models that have recently come into production. We’ve actually done a lot of cross-referencing so that we can help owners maintain their vehicles without breaking the bank. If you want factory quality service and parts, we can provide those. If you need a factory alternative, in terms of diagnostic, communication software, maintenance and repairs, we use all factory tools, all factory communication software, and only factory componentry for these vehicles. At the same time, if you desire to keep your luxury, exotic Maserati out on the road, and you can’t get an answer from the only dealership in the state that’s typically backlogged with these vehicles, we’re open 365 days a year for your convenience. We actually offer a membership program for Maserati owners, that if you participate in, you can call us 24 hrs a day, seven days a week, 365 days a year, and you’ll have a technician on the phone within 30 minutes answering any and all questions about you, your vehicle, your service, your repairs, and how we can help. If that means we need to come out to the side of the side and address your concerns we will. If that means we need to send a tow truck to come pick you up, and bring you to our facility, and put you in a rental immediately, we will. We’re here to support you no matter what. We’re here to support the artistry of these vehicles and keep them in the tip-top condition all the time. We also understand that these vehicles have a lot of cross-branding and a lot of shared model platform usage, and we take advantage of that in every way we can, if possible. 7939 East Arapahoe Road, in Greenwood Village, Colorado, seven days a week for your convenience. We Prove Time And Time Again We Will Repair Your Maserati Better Than Anyone In Denver! Maserati vehicles. Some of the most fun to drive, luxurious automobiles still sold in North America, now one of the rare and few ones to see come in for auto repair service. 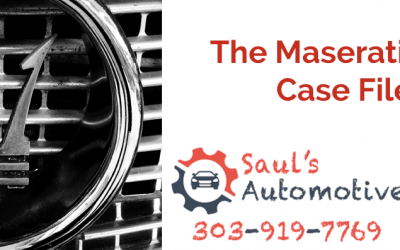 The Maserati Auto Repair Case File In Denver | Within 5 minutes left in the day we received a phone call from a local law firm.